Chef Chelsea's Polenta Cakes make a great appetizer or savory breakfast. 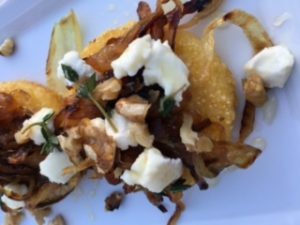 The combination of caramelized onions, tart goat cheese, nutty flavor of the walnuts, and local honey is out of this world delicious. Bring 3 cups water plus 1 Tbsp. oil to a boil. Lower heat. Slowly add the polenta and stir to prevent clumping until polenta is creamy and begins to thicken. Add salt and cook for about 10 more minutes. Lightly grease an 8x8 pan. With a spatula, spread polenta evenly across pan. Cover with parchment paper and smooth the top of the polenta with your hands. Refrigerate for about 1 hour. In a large sauté pan heat 3 Tbsp. olive oil on medium low heat. Add the yellow onions and salt. Stir onions occasionally for 40 minutes. Flip the sheet of polenta out onto a cutting board. Using a round cookie cutter, cut out as many cakes as possible. Heat a large sauté pan with olive oil and fry for 8-10 minutes on each side. 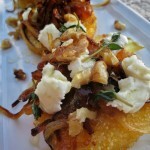 To assemble the cakes place fried polenta on platter, top with some of the caramelized onions, goat cheese crumbles, walnuts, thyme, and drizzle with honey. Makes about 6 cakes.